C6097A Series Gas Pressure Switch. 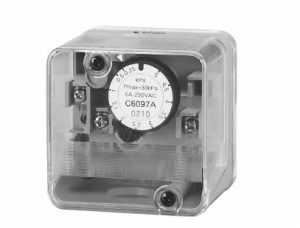 The C6097A Gas Pressure Switch is a pressure detector for city gas, natural gas, LP gas and air. The external electrical circuit is turned on and off according to the preset value. The device can be used is a variety of ways including detection of maximum/minimum gas/air pressure supplied to the gas burning device, burner blower interlock, or filter clogging. As a supplementary part (sold separately), there is a switch action display light for switching the gas pressure.